What’s the definition of ‘awesome’? As Bibi will attest, I have a problem with this word. People say a TV programme was awesome, that they just had an awesome cake etc. These things are not awesome. They are things you happen to like a lot but they do not inspire an overwhelming feeling of wonder, as the dictionary suggests awesome things should. Something’s going very wrong with life if a piece of cake is the most wonder-filled thing that happens in your day. Then again, I have an advantage here because I learned exactly what constitutes awesome when we ran the Yorkshire Marathon together at the weekend. Awesome is running 26.2 miles side by side with your baby girl, who is obviously no longer a baby because that would be illegal or at the very least not good parenting. Awesome is encouraging each other, chatting some, laughing some, being silent (apart from the heavy breathing and occasional inevitable runner’s grunt). Awesome are SuperPacer Bibi’s super-pacing skills; she got us round in record-quick time (record-quick for us, that is). The day started strangely, with FOG ALERTS in big capital letters from the race team. Hmm, we thought, what difference could a bit of fog make? 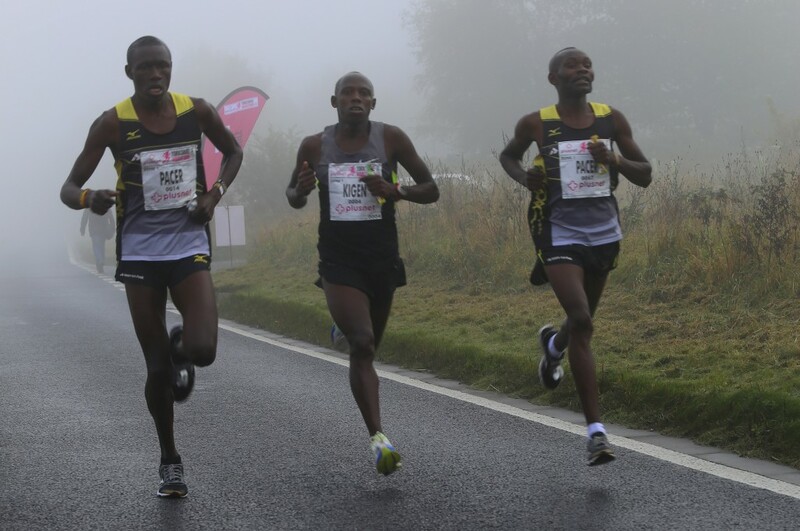 This photo of Boniface Kongin (on the left, a pacemaker who decided he could win it so did) and Cosmos Kigen, who came second, might give you some idea. The capital letters – FOG! – were definitely justified. Laura, a lovely fellow run blogger, said on Twitter running in fog was like running in clouds. We loved that. Being cloud runners made us feel like we were floating, even when we didn’t feel like that at all, if you see what I mean (like around mile 19 on a lengthy – and uphill, grrr! – out and back). Apart from making the landscape surreal, cloud running means you don’t get overheated either. We’re all for it. This year was a smoother ride than last. Bibi paced us, including our good friend, another fellow running blogger, Rose, who ran with us most of the way. (We do have some friends who are not running bloggers, btw). We were aiming for PBs and sub-4 but I’m a pacing numpty so Bibi spent much of the race telling me off, in a good way. I love it when she says ‘Chill out, mum!’ because I dash around like a divvy. No dramas, no fuss, nothing – nothing! – went wrong. We loved every minute and crossed the finish line together in 3.56.37, PBs and sub-4s nailed. Our friends came to meet us and brought cake and fizz. It was days ago and we’re still smiling. Bibi says that we became more than the sum of our parts that day, each making the other better, each helping the other get their best from it. I couldn’t agree more. What can I say? 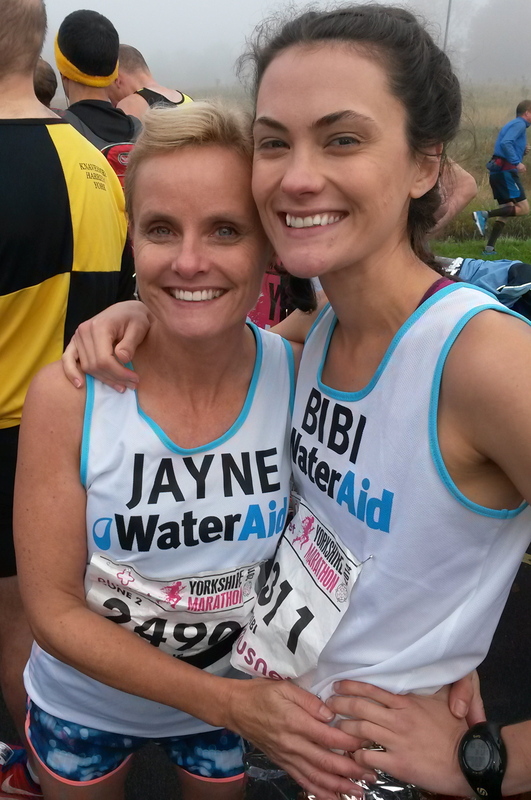 Yorkshire Marathon 2104 was freakin’ AWESOME!! 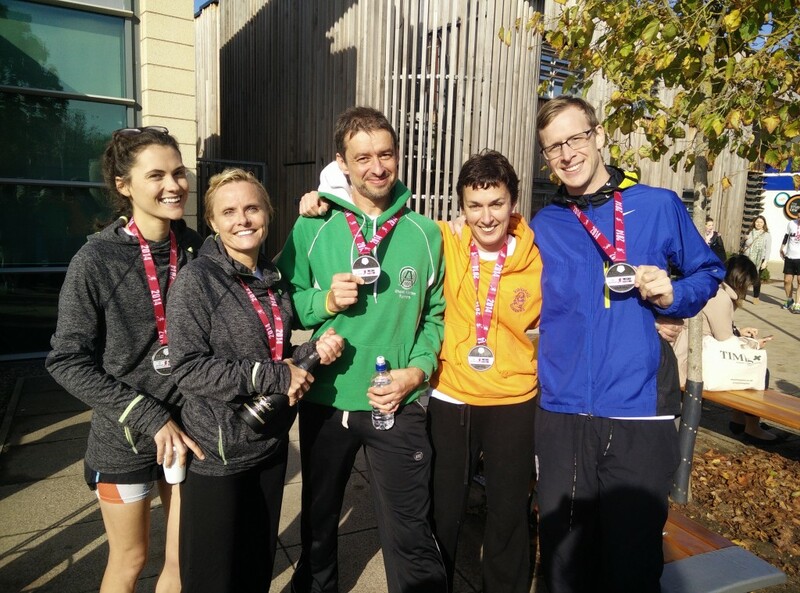 Happy with our homies after the race – Rose, plus David and Adam who make most of our fantastic, free running mixes. PBs all round! Thanks Brooks Running for our shoes (mine Pure Flow 3 and Bibi’s Ghost 7); we felt like we were flying. Thanks too to Sweaty Betty for my fab Time Trial Run Shorts. Who’d have thought it was possible to look stylish when running a marathon? And I’m not a total dummy, I have a great GPS watch to keep pace when Bibi doesn’t: TomTom Multi-Sport watch – totally recommended.